SMT Automatic Thread Cutting Machine is used to cut thread on blank of wood screws. The head slotted blanks are placed in a hopper at top from which automatic slide down with the help of feeder. A picker holds each blank one by one and feeds into a chuck and threading tool cuts thread on the blank and threaded screws fall down in a container/tray. The Thread Cutting Machine is fully automatic and simple in adjustment. The thread formed on Automatic Thread Cutting Machine is deep, cleaned, accurate and perfect with gimlet point. Machines can be operated by any person having little training. The Automatic Thread Cutting Machines can be availed at competitive price from us. 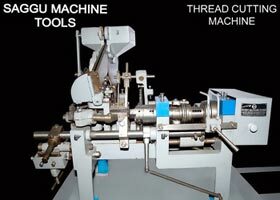 We are a prominent Automatic Thread Cutting Machine Manufacturer, Exporter and Supplier in Punjab (India).